Sol LeWitt (1928-2007), renowned for his role in establishing Conceptualism and Minimalism as dominant art movements in the postwar era, is perhaps best known for his masterful and brilliantly colored wall drawings. Throughout his career, however, LeWitt also created many remarkable three-dimensional works suitable for display in outdoor settings. In this handsome publication, which accompanies the first major career survey of LeWitt's "structures," the artist's modular works are traced from their simplest manifestation in a single large-scale cube through multiple variations, with examples from the 1960s through the 1990s. Works from the 1980s onward explore the three-dimensional possibilities of diverse geometric forms, such as stars, and the introduction of new materials, including concrete block and fiberglass, stimulating experimentation with non-geometric, irregular forms on an increasing scale. The book includes essays by Nicholas Baume and Joe Madura that provide curatorial and critical context for the structures. 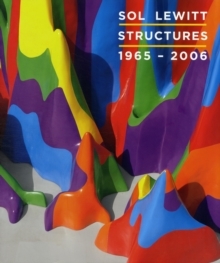 Additional essays by Rachel Haidu, Anna Lovatt, and Kirsten Swenson offer fresh art-historical commentary, ranging from the problematic of site for LeWitt's initial structures to the relationship between abstract conceptual systems, architecture, and urban space. Also included is a never before published conversation among the artist, Baume, and Jonathan Flatley. Stunning color plates record the works on display in Lower Manhattan's City Hall Park, supplemented by archival and historical documentation. Pages: 192 pages, 108 color illus.